Spark Organized Joy For Your Favorite Teacher! 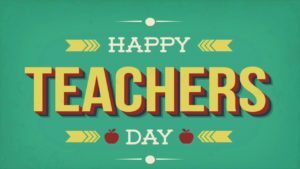 This month we celebrate the teachers we had and the teachers we know on National Teacher Day, May 5-11, 2019. I’ll be honoring a special teacher in my life, my husband, who has been teaching for more than 30 years! Here at LET’S MAKE ROOM, we will also be honoring teachers with a special offer (see below). For practically his entire career, he’s taught elementary school kids with specific learning challenges to read, write and and do math. He loves his job as much as he did when he started, though it hasn’t always been easy. Many of his students are from broken homes or have survived terrible trauma. Many experience a lot more than learning challenges. We were both humbled by the support he and 3,000 of his colleagues received, here in Oakland, California, from parents and other members of our community when they were on strike earlier this year (#unite4oaklandkids) fighting for fair pay, reduced class sizes and more student services such as nurses and school counselors. Even at a time when education is under siege in this country, due in great part to horrifyingly naive and destructive policies, teachers stay focused, committed and passionate about their mission. Many have “seen it all” and thankfully, take the long view that education will survive, no matter who is in office. Many of my clients are teachers, retired teachers and a few retired principals. What I’ve noticed is they all have one thing in common. Pride in the work they do or did before they retired. For many, being a teacher is more than a profession. It’s a calling. Especially for those who, like my husband, have dedicated their adult lives to educating children. I love it when my teacher-clients pull out their bins of hand-drawn cards given to them by former students. Or they show me the training guides and class notes they kept that helped them become better teachers. Almost all have photographs from their years of teaching showing them with children who have long since grown into adulthood. 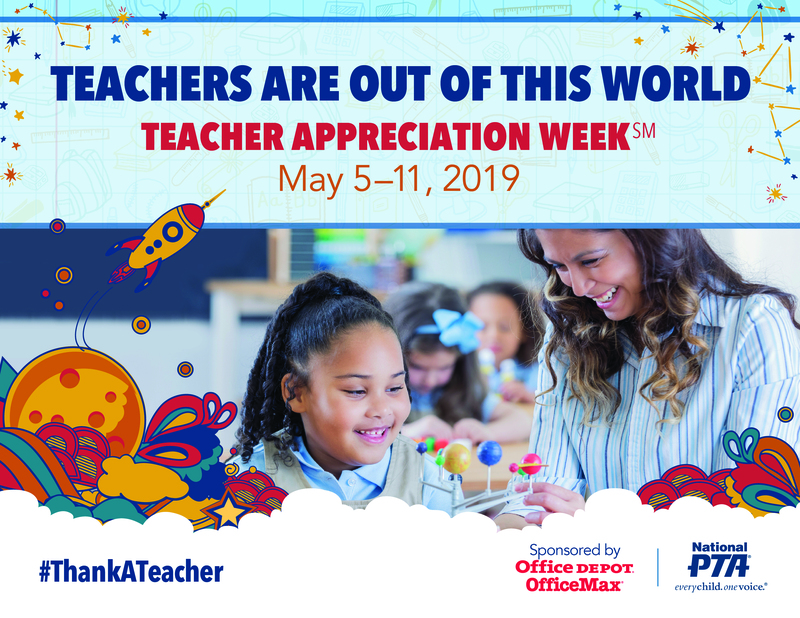 If you are a teacher (or know someone who is), either new to the profession or or a seasoned, veteran teacher, this month – May 2019 – say thank you to the teacher in your life (even if it’s you) by giving them the gift of organization. You’ll receive a 60-minute consultation to address any organizing challenge in your home, home office or even your classroom, absolutely FREE! Then if you decide to work with me, I will offer you an additional 20% off your first organizing session ($120 value). Even if you are not physically located near me, we can still work together via Skype, FaceTime or by phone. But don’t wait! This offer will end May 31st and appointments are limited. To schedule time to chat about your project click here. Garage or junk drawer: Getting it organized is the same process. Whenever I meet with a new client I show them how we organize a large space by organizing a small space. This is because it’s the same process, just on a smaller scale. Often I start with a junk drawer but no matter the size of the space, as long as you are organizing physical items (not paper) the process is the same. Gather the contents by emptying it onto a flat surface such as a table or bed. Dust out the drawer if needed. Sort items by type, such as pens with pens, tools with tools, paper with paper. Don’t throw anything away until you are done. Just focus on sorting. This should take just a few minutes. Don’t skip this step. It’s the most important! Purge what you don’t use, need or love. Start with obvious trash and move on from there. Usable items can be donated. 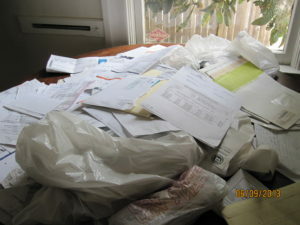 Loose bits of paper can be reviewed and recycled or shredded as needed. Decide what belongs back in the junk drawer or somewhere else in your home. Wait till you’re done before moving these items into other rooms, otherwise you’ll lose your momentum. Contain like items with small containers or a a drawer organizer. This will make it easy to find and return items when you’re done using them. It’s also important to start with the right tools such as bags or boxes for the items you no longer use, need or love. Want to see how it’s done? You are finally in bed after a long day. You cover yourself with a blanket; feel the warm comfort of your pillow beneath your head and the soft, cool sheets against your tired body. You begin to relax into a night of slumber when you are suddenly startled by the pinging sounds of your computer sending notifications about tomorrow’s busy day. You get up and turn down the volume and get back in bed. That’s when you notice the pile of papers strewn across your desk, in varying heights and reminding you of a slew of unfinished tasks, unpaid bills and projects still yet to be started. You shut your light out, hoping in darkness you will forget the site of all that you have left undone. All of a sudden you see the blinking of all your devices in random rhythms, your router, your modem, your phone. Your room lights up with a blue blinking glow. You cover your face with a pillow and somehow manage to fall into an exhausted sleep. In general, I don’t think a bedroom is a great place for your office. Your bedroom should be a place of respite, relaxation and most of all sleep. Yet sometimes, there is no choice. Space is at a premium. You share a home or an apartment and there is no other available space to work. This doesn’t mean you should lose sleep when your office is in your bedroom. Here are some ways you can minimize those distractions without sacrificing your personal productivity. Hide your desk. Space permitting, hide your desk behind a free-standing, decorative folding screen or room divider. You can buy them online or in most home decor stores. When it’s time to leave work, simply pull the screen around your desk. Shut out and shut down. Turn off or block digital noise and distractions. If you can’t hide your electronic equipment, things like your modem, router, or fax/printer behind or under your desk, place a small piece of dark blue painter’s tape over the lights that blink. Painter’s tape will not harm your equipment and can be easily removed or re-placed. This is especially recommended if you use a guest room for your office. You don’t want your guests losing sleep from all the pings and blinking lights. Re-purpose and reposition. 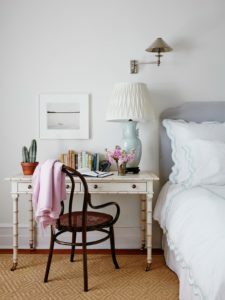 If your room is configured for it, why not turn your desk into a combination bedside table-workspace. That way, you are no longer looking at the desk from your bed. You’ll need a lamp on your desk anyway, so why not make it your bedside lamp. You can also leave a little room nearest your bed for a book or notepad, a place to put your reading glasses, a small plant or decorative item, and a clock or device with an alarm. In other words, all the things you would need nearby while you’re working. Clear the decks. Surfaces are notorious clutter catchers. No matter what size the surface, they have a way of getting covered with things. Just like you have a home, everything in your home should have a home. Take the time each day to survey what you have on your desk or work surface and decide 1) Can I toss it? 2) Does it need to live on my desk? 3) where else could it live in my home? Then toss it, move it or take it back to where it lives. No more homeless items! Create vertical storage. Install simple bracket or wall-shelves above your desk area for less frequently used items, books, or reference materials. Use decorative boxes in like colors to contain surplus office supplies. Get these all off your desk and on to a shelf to free up space for working, creating and being more productive. Equalize your workspace. Before leaving your desk for bed, take 60 seconds to put loose items in drawers, loose papers in a stack or contain them in a shallow box (e.g. an “in-box”). Review your calendar and most important to-dos for the next day. Then shut off your computer (or put it in “sleep mode”) along with all other unnecessary electronics. You’ll save money on your electric bill and may even get a few more Zs tonight. This year, why not give your Mom what she really wants for Mother’s day. More time to spend with her family, and less time to feel overwhelmed by her clutter, especially all that paper! Here’s what you can do: Suggest to Mom that you’d like to give her the gift of organization so she can feel more in control of her life and less stressed by all the paper clutter in her home. You can help her yourself or better yet, hire a Certified Professional Organizer, who can quickly identify and sort all it all. Once sorted, you can purge what’s no longer needed and contain what’s left either in labeled paper or digital files according to your mother’s preference and ability. If you decide to do this yourself, make it a time not just to plow through those piles but also to share the memories with Mom. Whatever you do though, don’t chastise Mom for keeping everything. No one was born with an “organizing gene” and the rules around paper have changed considerably since she was young, especially now that we are in a digital age though she may not be. Most of what we keep, as much as 80% according to several studies, we never refer to again. Old bills, especially utility bills, make up the bulk of what I’ve seen the most of when helping my clients tame their paper piles. I’ve seen floors literally buckle under the weight of boxes upon boxes of retained paper. Even if all the paper in these boxes were accidentally tossed the chances of needing anything in them is statistically small. That being said, there is always a chance that those boxes contain confidential information so to protect your Mom’s identity I recommend you arrange to have it picked up by a residential document destruction company in your area. In recent years the practice of including full account numbers has changed to protect individual identities but that has not always been the case. If your Mom has kept documents for more than 10-15 years, it’s possible some contain this type of confidential information. Note however, documents that contain just a name, address and phone number are part of public record (remember old phone books?) and nothing can be done with this information alone so it’s safe to recycle these. To get started, you will need a cardboard or plastic box labeled “SHRED” to contain documents for destruction. You will also need a supply of paper bags or boxes labeled “RECYCLE” and a smaller receptacle for “TRASH” such as the plastic that contains magazines and other junk mail. Lastly, you will also need a work surface. If table space is scarce, use a folding table or large ironing board if available. Use a “sharpie” for labeling if needed. These record retention and destruction recommendations are general best practices and not intended to replace the advice for you or your Mother’s specific situation, especially if she is ill, disabled, or in dispute with the IRS. In these cases, consult with your tax preparer or another legal professional. Personal includes: Educational and work history, cards, letters and other correspondence, general reference such as “project” or “idea” files. Binders that contain old training material, photographs, professional or published papers written or contributed to by your Mom and anything of a personal nature that could not be replaced if lost. As you do this you can toss the following: empty mailing envelopes, obvious junk mail, expired coupons, store receipts paid by by credit or debit card and old user guides or warranty information for products or appliances no longer owned. Keeping a focus on sorting will make purging later go that much faster. Home: Cancelled insurance policies, repair records for cars no longer owned, mortgage bills already paid, any reference material not referred to in over a year or that can easily be found elsewhere or online. Anything printed off the internet. Personal: Any personal reference material that has not been referred to in over a year (such as old recipes, remodel ideas, maps, wellness or hobby information, old magazines, binders containing old training material, greeting cards signed by unknown people, out-dated resumes, any document that can be easily found online. Children’s school records and drawings if not displayed. Take a digital photo instead. Personal papers such as these will most likely take up the bulk of your Mom’s paper files. Bank statements and investment statements by account name and last 4 digits of account number – most recent three months unless your Mom will be applying for assistance under Medicaid or MediCal. In this case she will need the last 5 years of bank statements. Records of recently paid household bills (less than one year) – if possible, set up auto pay and have bills issued paperlessly via email. Finally, identify any documents that require some kind of ACTION or to-dos that your mother feels are worth her time such as bills to be paid, forms to be filled out, greeting cards to be mailed, or items she wants to discuss with another professional. Put these items in a separate mail sorter on her desk or workspace, keeping the bills separate from everything else. Don’t put anything here that needs to be filed or contained. Any retained magazines should be placed where your Mom likes to read them. Once she is done with these items they can be filed, contained or tossed as needed. After you spend a few hours helping her, then take her out for lunch or dinner so you can both relax and enjoy some quality time together, knowing that you’ve made some room in your lives for what matters most. 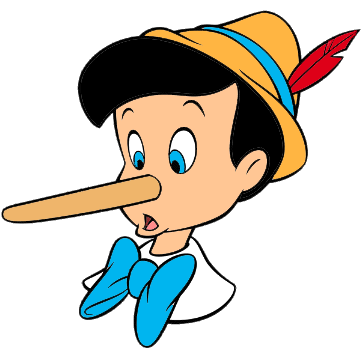 Anyone who juggles life’s internal and external demands, whether that be a promise to stay healthy or a need to get things done at home or at work, will recognize themselves in at least one of these 10 little lies. The lies themselves are a kind of time rationalization, says Dr. Ari Tuckman, author and subject expert on adult ADHD. The lies people tell themselves keep them disorganized or stuck in bad habits. How close in time something has to be done is what determines whether or not we take or avoid action. For example, if a deadline is looming within days or hours, we may be more apt to take action then if it’s weeks or months away. The closer something is to the present the more we see and feel its impact. This can either be felt as pleasure, such as a having our favorite food nearby or painful, such doing our taxes or preparing to move. In essence we are constantly asking ourselves, “Is it better to suffer in the present to experience joy in the future or should we aim to enjoy the present moment at the expense of possible future consequences?” It is an ongoing tug-a-war between the pleasure-motivated side of our brain and the executive function that helps us to make wiser choices that can also feel inconvenient or downright painful. How many of these 10 little lies do you tell yourself? I don’t have to write that down. I’ll remember. People fall somewhere on a continuum between complete impulsivity (those with attention issues) and overly diligent (those with obsessive tendencies). Those with better self awareness fall somewhere in the middle, says Dr. Tuckman. When you find yourself using one of these little lies, Dr. Tuckman advises stopping to pause and visualize the outcome as both your “today self” and your “tomorrow self.” Introducing that momentary pause and visualization can sometimes cause you to do something – like scheduling that appointment – and make the difference between staying on track or going off the rails. Even if you do everything on your smart phone, paper is still a fact of life, as is identity theft. Knowing what paper is safe to toss is not only a good habit, it will help minimize your chances of being a victim of identity fraud and make it easier for you to know just what to keep (e.g., for tax purposes) for when you want to get organized. TIP: If you don’t have a shredder, use a black marker to hide any confidential information on documents that contain an account number, medical record number or social security number before you toss. Items that may include this information are noted below with the word shred. TIP: Be sure you keep and regularly empty a recycling bin in the area where you do your paperwork. *These are general recommendations for household paper. If you own a business or have extenuating circumstances, such as you owe back-taxes, consult with your tax preparer or consult an attorney about your specific situation. Outer envelopes of mail you’ve received, even if it has your address. Paid bills after one year if you are not claiming them on your taxes (shred). Business cards for people or companies you would never do business with or meet for coffee. Loan documents when your loan has been sold or paid off (shred). Closed bank account statements and checks (shred). Investment statements, excepting your year-end statement and any records of trades (shred). Bank statements after one year unless they contain expenses you’ve claimed on your taxes (shred). Prescription receipts unless you claim them on your taxes (shred). Credit card statements after one year unless they contain expenses you claim on your taxes (shred). ATM and store receipts more than 30 days old. Paycheck stubs more after one year. Keep your W2 and tax return instead (shred). Lis McKinley, M.A., is the owner of LET’S MAKE ROOM based in Oakland, California. She is a Certified Professional Organizer and Move Manager specializing in helping homeowners and other residential clients get organized to move, remodel or simply enjoy their homes more with less of what they don’t need. At 8:00 this morning, I had my own private celebration. It took place in my head. An hour earlier I was driving and thinking about how terrifying it must be for some of my clients to do the one thing that scares them the most; To finally confront what’s kept them from moving forward in their lives because they feel overwhelmed and stuck and it’s showing up as piles of papers, boxes and who knows what else, on their desks, on the floor, in their drawers, everywhere. I was thinking about what it means to do the one thing that scares you the most and to have the courage to do it anyway because you know you have to. Because you know not doing so will have far greater consequences. For people who are chronically disorganized, the consequence of not facing their fears can be enormous. For some it’s a loss of control over their lives. For others, it’s isolation. I know people who have lost their children, their spouses and their very security because of their inability to face their fears head on. I also know people who have shown great courage and have discovered the meaning of making room in their lives. My fears are about public speaking. And yet, as a small business person I know the value it brings to others in the form of information and sometimes even inspiration. But I do it quite frankly because I have to. Working with people in their homes and in their offices or helping them move is tactical but it’s also very personal. I know that if people see me and feel I am someone they can trust, and recognize I have the expertise to help them, then they often will remember me when it comes time to organize their offices, or their bedrooms or help them plan and oversee their move to a new home. This is what I was thinking at seven o’clock this morning, on my way to speak to a group of fifty small business owners and entrepreneurs about how to face their fears, specifically about how to confront their own Paper Monsters. I did this presentation a few weeks earlier and it had not lived up to my expectations – perfectionism, my monster, rearing it’s ugly head, yet again – and now I was getting ready to face him again. Was I scared? Petrified, which is why at that moment I started thinking about my clients. “If they can have the courage to hire me, then I can damn well find the courage to face my fears as well, ” I thought. And so I did. And it went fine. It wasn’t perfect but it was good enough. And that’s good enough. But to be honest, I’m glad it’s over. At least for today I can celebrate. Tomorrow, I do it again. Are You A Hider or A Piler? Is your stuff – paper, possessions, or supplies – out in the open where you can see it? Do you forget, ignore or lose what you can’t see? On the other hand do you prefer to have everything you own tucked away – in a drawer, cabinet, or closet? Do you feel unsettled, anxious or out-of-control when things are not stored, stowed or put away? Do people always remark at how tidy your home looks? If the first example sounds more like you, consider yourself a Piler. On the other hand, if the second example resonates more strongly with you, you are probably a Hider. The terms Hider and Piler represent two types on an organizing continuum. Generally people fall somewhere along the continuum preferring one kind of organizing habit over another. These are not absolutes. Understanding your – and others – preferred type can help you learn ways to be and stay organized as well as to help you better understand the habits of others. For couples, its common for one partner to be a Hider and the other a Piler. Understanding your partner’s style and how they think about organizing will help keep the peace at home. The most important thing to know is that both Hiders and Pilers can be equally organized or disorganized. upplies and a disorganized Piler as illustrated by the photo of the cluttered office. The column on the right represents two versions of a Hider organizing stye – an organized Hider as represented by the physician’s examination room and a disorganized Hider as exemplified by the cluttered drawer. Organizing styles can be dictated by function – such as the need for safe and sanitary conditions as in a doctor’s office or the need for customers to find what they are looking for quickly and easily as in the bead store example. For most people, however, organizing styles emerge from our individual personalities, learned habits or in some cases, physical or emotional conditions. It’s helpful to think of Hider and Piler as preferences, rather than extremes, with most people falling somewhere between them but leaning towards one or another at varying degrees. While I have not conducted a scientific study about organizing preferences, in my experience as a professional organizer, I have found that Hiders and Pilers also share some other characteristics. For example, Pilers, because they like items out where they can seem them, may not benefit as much from conventional organizing methods. An example of this is a standard two-drawer file cabinet. A better solution for a Piler is an open file drawer on wheels that allows them to see and file their papers and then stow them away as needed. Many of my clients who I would consider Pilers are artists, creative types or visual learners. They are stimulated by various forms of color, design, objects, and words. A Piler who does not feel comfortable expressing himself in a particular environment may find substitutes for filling the space in other ways. An example of this are artists who earn income in an office setting. To compensate for the design of a standard office cubicle – with things like closed, overhead bins – artists and other Pilers often fill their surfaces with paper, piles or other bulky supplies. When I notice a client doing this, once we’ve worked together on organizing the paper, I often recommend they find objects, artwork or photographs to fill the space (in lieu of the paper) that inspire them. Conversely, a Hider may feel torn between her need for order and the desire to consume, purchase or own items of perceived value. From the outside, everything looks fine, even beautiful. Until you open a drawer, cabinet or closet. Then suddenly everything spills out in a jumble. This is what I call the “Jack-in-the-box” phenomenon. Typically hiders call me when their clutter starts creeping out from the drawers, cabinets and closets because they’ve run out of room. I often recommend to Hiders that they examine their beliefs about what they value so that they can begin to edit down what they have. I also remind them that storage areas are valuable ‘real estate.’ If they want to cut down on the clutter-creep they are either going to have to maximize the real estate, through editing, or else be at risk of spending more to house thier stuff. The worst case scenario is when people buy bigger homes or invest in expensive storage units to accommodate items they don’t use, want or need. A hider can also lean towards the other extreme, purging themselves of all but the minimum necessities, sometimes prematurely, maintaining a tidy space albeit a bit sterile or overly staged. In the fall I will be conducting an online seminar about Hiders and Pilers. If you are interested or want more information, email me at Lis@letsmakeroom.com. Want to know my resolution for 2012? I attended a workshop recently where I was asked to write down my three biggest accomplishments from 2011 and then later was asked to write down my top three goals for 2012. I was surprised to discover that my biggest accomplishments were all related to my work life while my goals for 2012 were all related to my personal life. It dawned on me that the bigger message in this was that it was time to start shifting some time and focus to my own well-being. 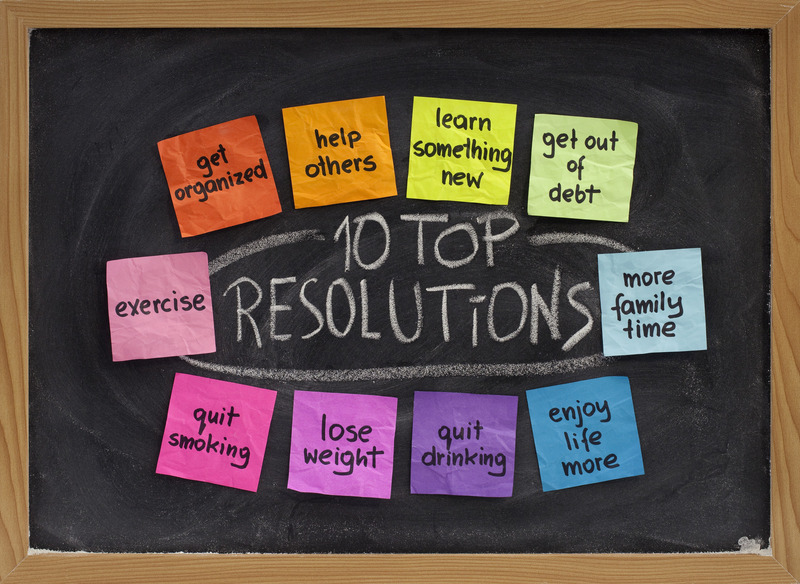 Some resolutions are about stopping a behavior that is destructive to you and some are about starting a behavior that will contribute to your overall quality of life. So this year, make a resolution that doubles it’s impact on your life. But be sure it’s something you really want and are ready to commit to. Then track your progress by setting up mini goals that make it easier for you to move closer to your larger goal. Here’s mine for example: I want to lose weight and feel better. Rather than put it in the form of pounds, I’ve decided to put it in the form of a percentage. Why? Because there are real and measurable benefits from losing even 5% of your body weight when you are overweight (as I am). Here’s to a healthier, happier and more caring 2012!